Welcome aboard the Chubasco II! 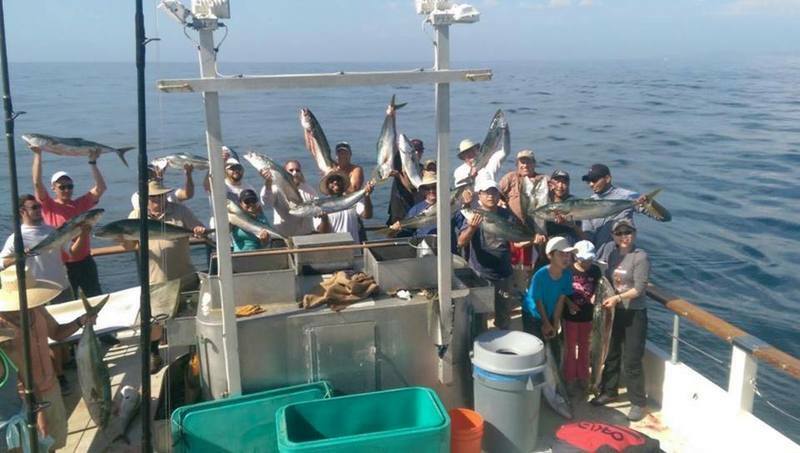 Aboard the Chubasco II you can hook up to Yellowtail, Barracuda, Bonito, Calico Bass, Sand Bass, White Sea Bass, Halibut, Sculpin, Rockfish and many more. The Chubasco II is 60'by 20' and features a low deck with a spacious fishing area. She has the latest fish finding equipment, including side-scanning sonar. She is freshly re-powered with low emmission diesels that give it a quick and comfortable cruising speed. A larger live bait system has been added to insure that we will have enough bait for that "hot bite". Measures have also been taken to protect the quality of your catch. She has a full service galley that serves hot and cold meals, snacks and beverages(please NO ice chest or alcoholic beverages to be brought onboard). Licensed for 49 passengers, we welcome company and group charters. Our experienced crew is there to help our customers have an enjoyable outing for you, your family and your friends. Ernie Prieto III, captain and owner of the Chubasco II was raised in Southern California and is the third generation of fisherman who have fished the shores of Southern California and Mexico for over 60 years. He loves fishing and knows how to treat his clients. He welcomes you to join him and his professional crew. The Chubasco II is an excellent choice for charter groups of up to 40 who are looking for a relaxing daylong adventure along the coastal waters of San Diego County. Company groups rewarding their employees for a job well done or entertaining clients can rest assured that they will have the best of times as well as the most professional atmosphere offered on any boat today. So if it's service with a smile, fishing enthusiasm, and light-hearted atmosphere that you're looking for, the Chubasco II is the only way to go! We have plenty of free parking across from our docks! Not included in quoted rates are: California fishing licenses, rod rental, food, beverages, terminal tackle, fish cleaning, or gratuity.